The Kenyan poet Jared Angira was born in 1947 and studied commerce at the University of Nairobi where he was also the editor of the journal Busara. He has spent much of his working life in the Kenyan civil service, and published seven volumes of poetry, which include Juices (1970), Silent Voices (1972), Soft Corals (1973), Cascades (1979), The Years Go By (1980), and Tides of Time: Selected Poems (1996). He was once hailed by Wole Soyinka and lauded by Ezenwa-Ohaeto as “one of the most exciting poets in Africa.” As with many of his contemporary African poets, he has not received the critical acclaim many think he deserves. Deeply meditative, Angira’s work is deceptively simple and his choice of words may occasionally seem at odds with the gravity of his subject. As a Marxist poet—he once proclaimed: “Karl Marx is my teacher; Pablo Neruda my class prefect (when I am in the classroom) and my captain (when I am on the battlefield)”—his poetry evinces a critical concern with social injustice in post-independence society. Like his fellow Kenyan, Ngugi wa Thiongo, he is very critical of political and social developments in Kenya. isn’t our flag red, black, and white? tractors and plough the land. This is a scornfully sarcastic poem by Angira and many reviewers claim that it also mirrors his style. The poem is a chronicle of events that marked the death of a traitor-ruler who was “buried without a coffin” (line 1) and whose post-mortem was carried out by scavengers, vultures in the open, outside a place where people go to celebrate and have fun. A night club! (line 6). This gives a sense that his death may have been wished and when it came, it was a necessary party for his people. Angira goes on to say that “stuttering rifles” (line 7) gave the salute when he died. The same two quoted word are used in Wilfred Owen’s poem “Anthem for Doomed Youth” where he discusses the scene before a war, intimating that the soldiers on the field are doomed to death by the shots from their own stuttering rifles. As is signal of state burials, prominent people are given a uniform salute by a regimental gunshot of a section of the army. But our politician only received a stuttering rifle’s salute, to give us a hint that his gun salute was probably the bullets that killed him; ununiformed. And confirmation reaches us, when we read that his car knelt – came to its knees, literally – in a defeatist action and wrapped itself in its master’s blood (lines 10-11). He died in his car and the car came to a grinding halt. Angira quotes the colours of the Kenyan flag (red, black and white- line 14) as testament to the true nature of the politician whose deeds alone were correct. So since there wasn’t any yellow, he asks “Who could signal yellow” or contradict the politicians? After all, politics was for the “experts” while the common man was cursed to brood on books, think about schoolgirls and hunger, sleeping under torn mosquito nets (lines 15-22). And if our politician should step into a bar, he is the lord (line 24) and woman magnet (line 25) who speaks the language of money; the people’s money. And what can the cursed common man say? He can only cover the darkness of his mouth and tell his prayers to the devil for all the politician cares. The succeeding verse tells of how our politician’s diary reveals that he wanted a stately VIP burial, with a gold-laden coffin at his palace and with so much beer. Angira earlier in line 12 says that the diary revealed itself to the sea, to say that it was found there in the sea. And now, in line 30, he calls the diary a submarine of the Third World War. This is interesting analogy. It could mean that the diary was found in the sea as a submarine, it is content was a destructive weapon as a submarine that brought the poverty and hunger of the people, or that it had enough power in its recommendation to dump the world into a Third World War. This is beautiful use of language. So, it has come to pass that Angira’s politician has passed away, with much celebration from his people. And with little dignity too, having been denied all the pleasantries that he wished to be accorded his death. The people care less and in the last line, one boy Angira calls noisy, even suggests that they bring tractors and plough the land, ostensibly to purge it of the desecration that this our politician’s blood may have caused it. And why is the boy even called noisy unless it means that other people have already said the same thing? This is a beautiful protest poem and I can see a lot of African leaders past and present fit Angira’s politician well, in deed. 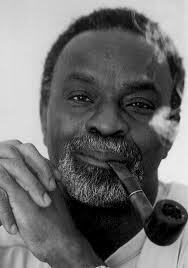 Syl Cheney-Coker (born 1945) is a poet, novelist, and journalist from Freetown, Sierra Leone. He has Creole backgrounds. He was educated early in Sierra Leone and then in the United States and he has a global sense of literary history. He has introduced styles and techniques from French and Latin American literatures to Sierra Leone. Most of his life has been spent away from his native country and through those eyes he has written extensively (in poetry, fiction, and nonfiction) about the condition of exile and the view of Africa from an African abroad. He has taught both African and Latin American literature in a number of countries, having learnt to speak Spanish fluently after sojourning in Argentina, Chile, America and the Philippines. His volumes of poetry include Concerto for an Exile (1973) and The Graveyard also has Teeth (1980). Cheney-Coker has written of his love for the continent of his birth and the agony of having to live away from it since he could not tolerate the one-party government of then President Siaka Stevens. In many of his works, he shows the passion and love for the continent that is innate in all true African poets. The agony: I say their agony! Africa beware! their patience is running out! This poem is a protest poem which identifies with the down-trodden African peasant who does most of the work that drives his country yet paying him insignificant rewards. In the lines of the poem, Cheney-Coker identifies many points of “agony” of the peasant and illustrates singular experiences of these men left poor by their politicians, that makes for pondering. In the lines of the poem, he has disregarded the correct use of grammar in first-letter capitalisation except in the first and last lines…and even the last line has a second sentence that disregards the rule too. This is a statement of his anger; when people are angry, their respect for the rules is usually close to nothing. Cheney-Coker seems to bundle this long list of complaints for the politicians of Africa. He enumerates how they marshal these peasants at election time (line8) and forget them at banquet nights; how they are treated like slaves, left in roach-infested shacks and being used as labour for the many luxuries that the politicians enjoy. They are scornfully given party cards but never part support. They have little to take care of their children who develop projectile bellies (line 12) and for whom intolerable school fees (line 19) are paid to study meaningless languages and ‘isms ready for non-existent jobs. This looks like a tall pile of complaints which are building up anger one after another. To be able to appease the peasant, you must appease him layer by layer and agony by agony. A tall order, this. But Cheney-Coker says the height of it all – the supposed icing – is being asked to being asked to be patient about it all. And he calls it “the damn agony” (line 21). Who can bottle up such intense frustration with a slick of patience? It won’t be long before the patience is broken. I chose this poem as a tribute to the revolutions that started in Tunisia and spread to Egypt and the Middle East, albeit being suppressed this very minute in Libya. This poem is a prophecy of all those happenings in a way, pre-informing African leaders that their people want them to know that “their patience is running out” (line 22). If only African leaders read African poetry! !